The number of abortions in America hit an historic low in 2015, the latest year with complete data, when there were 638,000 abortions. Fewer women are having abortions in recent years. The Supreme Court legalized abortion in its Roe v. Wade decision in 1973. By 1980 there were 1.3 million abortions, 1.4 million in 1990, and 1.2 million in 1997. The numbers have declined ever since. In 2000 the figure was 857,000 and 765,000 in 2010. The 638,000 figure for 2015 is a decrease of 2% from in 2014, according to the Centers for Disease Control. It is important to note that these figures include both surgical abortions and "medical abortions" in which the women take pills to induce an abortion. Medical abortions are 27% of all abortions. However, the figures above do not include any abortions of women in California, New Hampshire and Maryland. These states do not report their number of abortions! With 39.1 million residents in 2015, California had more than a tenth of the U.S. population of 321 million. It is also a liberal state where there are likely to be more abortions than in more conservative states. Therefore, the Guttmacher Institute estimates the actual number of abortions in 2014 was 926,000, which would include numbers from California, New Hampshire and Maryland. That figure is 31% higher than the official CDC number. There is a better answer - adoption. A woman who is pregnant out of wedlock, who has no interest in marrying the father of the child in her womb should consider giving birth to the child and relinquishing it for adoption. Eleven weeks ago, "John" and "Stacy" adopted a child born to a 17-year-old girl in high school. "We have been trying to start a family for nine years," John told me. "We tried everything including in vitro fertilization, but nothing worked." Stacy added, "We wanted a child so desperately. We had a great experience with the birth family, and could not love our baby any more." John added, "It does not make any sense for a 17-year-old who is in high school, to raise a child. It is tough to be a parent. I can't imagine doing so as a 17-year-old. She went through the pregnancy and gave us this beautiful gift." "Everybody wins. 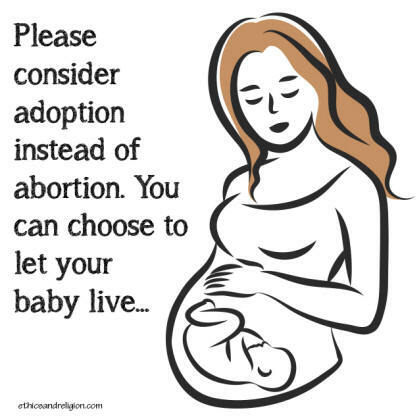 The birth mother does not have to abort - which could turn into a lifelong regret. A family who wants to start a family wins. We have been able to start a family which we have been wanting. It is a win-win situation," he added exuberantly. In addition, it might be noted that there is a $13,460 adoption credit for the family that takes this step to give an unrelated child a permanent home. What's tragic is that there were 1,605,000 births to unwed mothers in 2014 - 40% of all births! That figure is 20 TIMES the 2% unwed birth rate of Japan! Those children - like the children of divorce - will tend to not fare well in America. Children of divorce or of non-marriage are three times more likely to be expelled from school or to have a child as a teenager as are children from intact homes, are five times more apt to live in poverty, six times more likely to commit suicide and 12 times more apt to be incarcerated. What can be done to reduce abortions and unwed births? In 1960, 430,000 couples were cohabiting. That number soared 18-fold to 8 million cohabiting couples in 2016. That's more than triple the 2.3 million couples who married that year. While 60% of those who married were cohabiting, 6.6 million cohabiting couples will break up short of marriage. And couples who cohabit before marrying are more likely to divorce. One result is that America's marriage rate has plunged. There were more weddings in 1970 (2,159,000) than in 2015 (2,077,000). Yet the U.S. population grew from 203 million to 319 million in those years. It is time for the church to honor its belief in God's first institution - marriage.